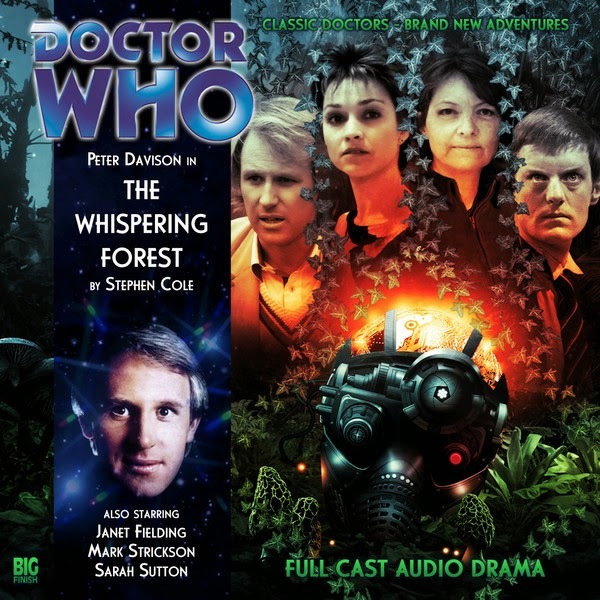 Doctor Who: Big Finish - THE WHISPERING FOREST Review | Warped Factor - Words in the Key of Geek. Doctor Who has a grand tradition of stories where ordinary procedures invented by civilized people degenerate over time into blind obedience, ritual and tribalism – The Face of Evil is probably the best and best known such story, though State of Decay too trod the path with a degree of success. The Whispering Forest is another bold entry in the same vein, but it’s also a kind of scientific-mythological fairy tale, and a battle for what constitutes the truth to boot. Writer Stephen Cole takes us very much ‘into the woods,’ to visit the inhabitants of Purity Bay on the deeply disconcerting planet, Cherdor. The people of Purity Bay observe endless rituals of cleansing, to the point of ruthlessly scrubbing their skin with savage soap to exorcise what have become over time their greatest fears – dirt, infection, and material impurity, which is an avatar for spiritual impurity (a literal interpretation of cleanliness being next to godliness). The people it would be deliciously easily to call Puritans (though they’re never referred to this way) are ruled by a kind of feudal dynasty, and despite the cleanliness-obsession, there’s plenty of good old-fashioned dirty politics to be had in Purity Bay, with the inexperienced Sister Seska – the new young leader, and effectively the ‘Princess’ of Purity Bay - threatened by the ambitions of her wicked stepmother, Sister Mertil. So far, so Cinderella in this story of dark, mysterious forests, rigid rules and both domestic and community politics. Seska’s father (and Mertil’s husband) Jestan, who ruled with a greater ease and balance despite the death of his first wife, has not long died, leaving the rule of the community up for question between these two women – Seska more open to change and to new ways of doing things, Mertil a hardline reactionary with a full-blown mania for religious zealotry and power – as they vie for the hearts and minds of the people. Into this monarchy of clean-freaks step the Fifth Doctor, with Tardis full of companions – Nyssa, Tegan and Turlough. Immediately seen as a threat to the Bay’s purity by Mertil, and as – perhaps – something else by Seska, the political battle becomes a simple matter of picking the side that doesn’t want to kill our heroes, at least as far as the listener is concerned. But it becomes quickly clear that the Puritans are just one term in the equation of the planet, and that the filth and infection they fear is a particularly localized problem. They have other fears ingrained beneath the surface too – particularly ‘the Takers,’ and ‘the Shades,’ spirits that make the forest whisper. The degree of success with which these other elements are fitted into the history of the Purity Bay populace varies – the Takers, when their origin is explained (as it inevitably is when the Doctor starts poking around at some ancient equipment and then running away) make a reasonable degree of sense, particularly given the kind of story this is. It’s an interesting additional element that people who are taken by the Takers are perhaps not as permanently gone as the people of Purity believe, and the historical relationship between the Purity Bay inhabitants and the Takers is explained in a logical way that harks back to some of the on screen stories of societal degeneration. The Shades responsible for the whispering forest itself are less convincing by several orders of magnitude, and the story builds in two ways – the political battle and the revelations about the Takers, which are satisfyingly gritty, and the revelations about the Shades, which, perhaps intentionally, are a rather ‘airy fairy’ element of the fairy story. Ultimately, the history of the Purity Bay settlers is given a resolution that satisfies, even if the story has to go round in rather a complicated loop to get there, but the core of the story is essentially the inability of the Doctor and his friends to be a neutral element wherever they land – they are habitually drawn into local conflicts, and their external knowledge helps them unravel the truth of things, leaving the people of the region changed forever as a result. Alongside the fairy tale elements, the battle between Seska and Mertil has Shakespearean overtones, particularly as it develops, and can also be seen as a kind of Masque of Mandragora parallel, the battle between open-minded pragmatism about the world and a religious dogmatism that threatens not only to keep the people of Purity Bay enslaved to their rituals of ‘holding tight,’ but also to the tight grip of the increasingly tyrannical Mertil and her kind. As ever, the Doctor, being an advocate of science over ritualism as a way of life, throws his lot in with the more open of the contending minds, and life on the planet is never the same again. Cole blends most of his elements well, and there’s a good deal for at least two of the companions to do – Turlough taking on the Takers and discovering their nature, while Tegan is actively taken by them, though they’re none too pleased about it and neither is she. Mysteriously though, they decide she might be able to stay with them after all, for reasons that aren’t given at the time. Nyssa is less well served, showing as ever just how hard it is to provide satisfying action with a Tardis quite this full. It’s true that the key to the whole scenario is held by the Shades, but the explanation for them is the most outlandishly pure sci-fi element of the story, and the one which convinces the least. Nevertheless, once everything is sorted out and the future for the Purity Bay community is established, there’s an additional sting in the tale of this story – much as the end of Frontios delivered a kick of Dalek action to drag the viewer back in front of their TV screen the next week to watch Resurrection of the Daleks, the reason the Takers changed their mind about Tegan is revealed at the end of The Whispering Forest, and the forest setting feels appropriate for an ending that reminds the listener of Deva Loka in Kinda, and leads immediately into the next story, The Cradle of the Snake. There are no prizes for guessing what particular snake that is, and while The Whispering Forest is never going to be a must-listen – it’s a little too formulaic for that, and one of its central premises doesn’t quite convince – it certainly delivers a more-than-competent slice of believable 80s Who that sets the listener up for an epic battle to come. Essential listening, then? No. But certainly enjoyable, if occasionally confusing and occasionally predictable listening that has a solid period flavor, a political moral, a believable story of societal degeneration and a family saga of an enjoyable grandeur within a Doctor Who setting.